The Status screen provides a lot of useful information about the status of your Almond+ and the network in general. 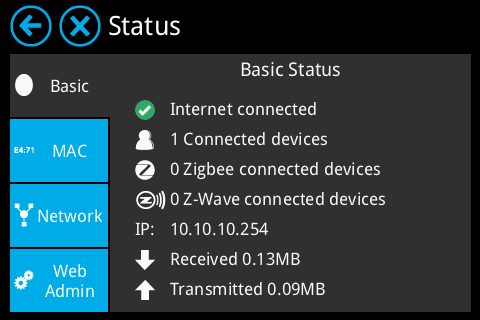 The Basic status tab shows if your Almond+ is connected to the internet, as well as how many connected users (read computers, tablets, smartphones etc.) and how many connected ZigBee and Z-Wave devices your Almond+ has. You can also find the IP address of your Almond+ here. 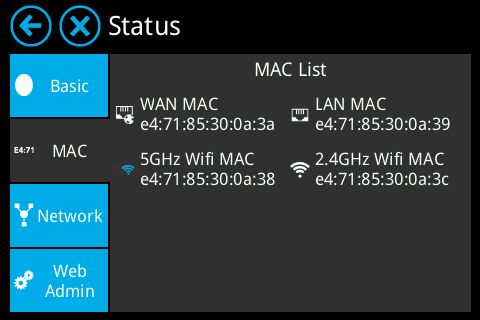 The MAC tab screen simply displays the MAC address for the WAN, LAN and two Wi-Fi networks of your Almond+. 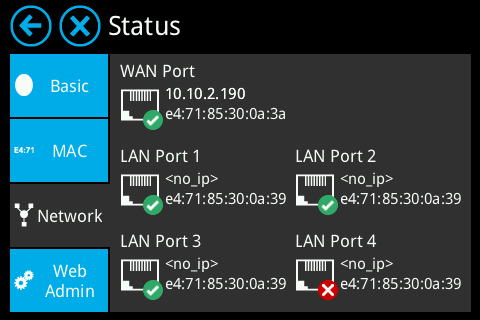 The Network tab provides the IP address wired devices that are connected directly to a network port of your Almond+. If you use a hub or a switch, the information here won't be displated correctly. You can also see if there's something connected to a specific port and if it's working by the green tick mark versus the red cross mark. The Web Admin tab provides details on how to access the web admin UI of your Almond+. Note: An option to obscure the password will be added in a future firmware update. This page was last modified on 7 July 2014, at 07:33.